Flight Update Pro provides timely flight status information combined with numerous convenient & powerful features every traveler requires. ✈APP EXCLUSIVES: This is the ONLY flight app that can: search for both direct AND non-direct flights and offers fully customizable alerts to changes in your flight. This is the most comprehensive flight app available! To use Flight Update, just select an airline, flight number and date of travel. Flight Update will validate each flight and then auto-fill the remaining information about your flight, regardless if the flight is one day, one month or even one year in advance. 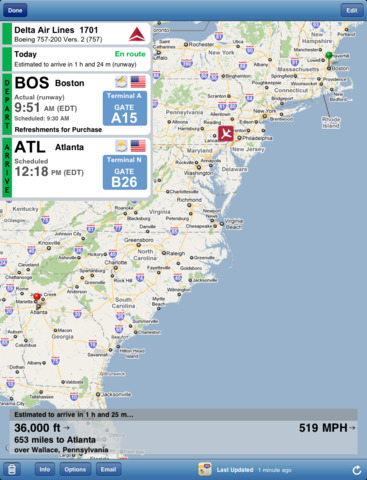 FlightUpdate works seamlessly with TripIt. Email your airline confirmation to TripIt and it will automatically appear in the app. Can also upload changes to TripIt easily from your device-exclusive to our app. ✔ Push notifications - alerts prior to departure, schedule changes, gate changes, departure and arrival. FULLY CUSTOMIZABLE- ONLY APP THAT HAS THIS FEATURE. ✔ TripIt Syncing - download your itinerary from TripIt and upload any changes via your device. Also, download trips shared with you by others. ✔ Concise display of layover times between your connecting flights. Need an app to manage all the components of your trip? Check out our Award Winning TRAVELTRACKER PRO app. It's a full service itinerary app which organizes your hotels, car rentals, limos, dining reservations and more. If you have any problems with installation or in-app purchase, found bugs, questions, comments about this application, you can visit the official website of Silverware Software Silverware at http://www.SilverwareSoftware.com/Flight_Update.html. 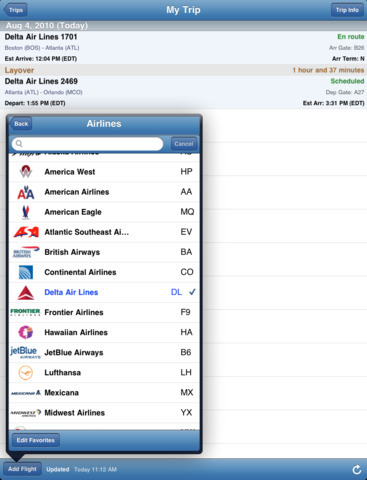 The #1 app to TRACK, ORGANIZE and RECIEVE NOTIFICATION about your flights. Rated BEST flight tracking app by top independent reviewers, David Pogue of Yahoo Tech and Jason Snell of Macworld. Don't see your suggestion for Flight Update Pro? We are committed to regular updates so drop us an email and we can update you as to when it is going to make it into the app. * Fixes a bug with push notifications. * NEW - Saves Frequent Searches when doing InstaFlight and allows quick selection from that list. * NEW - Allows Calendar Mirroring to be switched on/off on a per trip basis. We want to thank all our customers for supporting our apps. We hope you will continue to provide us feedback and encourage you to post reviews of this lastest version.